Kristelle has taken the Grand Prix of the city ‘Student Spring-2013’ contest and has passed to the district competition round. Her performance made the audience shiver and generated a lot of positive emotions. The main proof of the fact, that the Gala concert was great and Kristelle’s performance was a success, was the gladness on the faces of the people, after the festival was over. Even happy tears could be seen in somebody’s eyes. The jurors were professional ones in music and vocal. 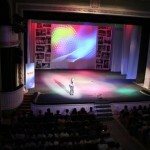 The level of the ‘Student Spring’ city contest was highly appreciated by the Tambov city administration.